Egypt's cabinet, led by Prime Minister Ibrahim Mehleb, was sworn in on Saturday afternoon after a reshuffle which saw around a third of the ministers replaced. 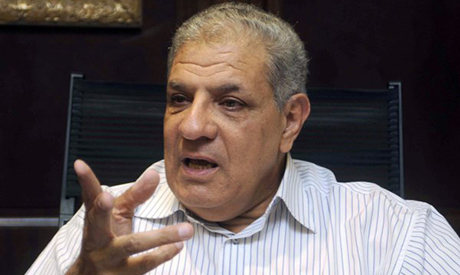 Mehleb was appointed by President Adly Mansour after the resignation of Hazem El-Beblawi on Monday. Twenty ministers from the cabinet of outgoing prime minister Hazem El-Beblawi will retain their positions in the new cabinet, while eleven new ministers have been selected. The cabinet reshuffle saw 12 ministries merged to become six: the ministries of trade and investment were combined, as were the planning and cooperation ministries, the youth and sports ministries, the higher education and scientific research ministries, the local and administrative development ministries, and the ministries of transitional justice and of parliamentary affairs. Field Marshal Abdel-Fatah El-Sisi, who is also the head of the Supreme Council of the Armed Forces, will continue as defence minister. If El-Sisi stands for president -- as is widely expected -- he must resign from his ministerial post and his position as head of the armed forces. Interim President Adly Mansour issued on Wednesday a decree that states that the defence minister must be a military officer and have served in the armed forces at the rank of major general for at least five years. Many of the outgoing cabinet's most highly recognised figures will not be joining the new lineup, including Hossam Eissa, who served as deputy prime minister and higher education minister, Kamal Abu-Eita, who was manpower minister, and finance minister Ahmed Galal. El-Sisi was first appointed defence minister and commander of the armed forces by president Mohamed Morsi in 2012. He later took the lead in announcing the ouster of Morsi in July 2013, backed by several political parties and figures amid mass protests against the Islamist president. After Morsi’s ouster, he retained his position as defence minister and was also appointed as one of two deputy prime ministers. He has become a powerful and popular figure in Egypt since Morsi’s ouster, with many calling on him to run for president. Interim President Adly Mansour issued a decree in January promoting El-Sisi to the rank of field marshal. Also in January, the Supreme Council of the Armed Forces released an official statement approving of El-Sisi’s run for president. The SCAF statement said that based on El-Sisi's efforts during these "historic times," SCAF considers the army chief's run for presidency "a mandate and an obligation." El-Sisi has yet to officially announce whether or not he will run in the upcoming elections. To be eligible to do so, he would need to resign from his military position. Ibrahim was originally appointed in a cabinet reshuffle in January 2013, and was one of the few ministers to keep his post after the ouster of president Mohamed Morsi. Human rights activists and several opposition figures have been calling for his dismissal since the dispersal of pro-Morsi protest camps in Rabaa Al-Adawiya and Nahda Square left hundreds dead. Under Ibrahim's leadership, the police have launched a broad crackdown on Islamists and more recently on secular opposition activists. Ibrahim's main challenge has been a militant insurgency in the Sinai Peninsula and a growing number of terrorist attacks across the country that have killed dozens of police and soldiers. Zaazou, 59, continues in his post as tourism minister. He is a political independent who was appointed tourism minister in August 2012. He was previously assistant to former tourism minister Mounir Fakhry Abdel-Nour. Zaazou resigned in June when a member of militant Islamist group Al-Gamaa Al-Islamiya was appointed governor of Luxor. He later withdrew his resignation and continued as minister after the governor resigned. This is the third time El-Demeiri has been chosen as transportation minister. His first term was from 1999 to 2002. He was removed from office after an overcrowded train caught fire in Feburary 2002, killing 373, in Egypt’s worst train disaster. Helmy was originally appointed communications minister in January 2013. He resigned from the cabinet on 1 July in protest at Mohamed Morsi's failure to respond to nationwide protests against his rule. A graduate of a military technical college, Helmy obtained a diploma in computer science from Ain Shams University in 1979. After leaving the army in 1983, he began his career in the civilian IT sector, working at several Egyptian and multinational corporations, including Oracle Egypt, where he became managing director. Labib, 68, served as governor of several provinces under Hosni Mubarak, including Qena in Upper Egypt, Beheira in the Nile Delta, and Alexandria. There were major protests against him in Alexandria, with some local groups accusing him of mismanagement. In 2011, prime minister Essam Sharaf appointed him governor of Qena for a second time after local protesters backed him over an unpopular alternative. He was Qena governor until June 2012 when he was replaced in a reshuffle by president Mohamed Morsi. Abu Hadid was first appointed agriculture minister in the cabinet of Ahmed Shafiq, which was formed during the January 2011 uprising. He continued to serve as minister in the following cabinet under Essam Sharaf. He was replaced as minister under Hisham Qandil in 2012. Ibrahim was appointed minister of antiquities in December 2012 in the cabinet of prime minister Kamal Ganzouri, and continued in the role under Hisham Qandil until May 2013. A professor of antiquities at Ain Shams University, Ibrahim has many critics among Egyptian archaeologists, including ministry employees. Critics of Ibrahim say that during his tenure he failed to address corruption, did not provide temporary ministry employees with permanent contracts, and allowed the situation at archeological sites to deteriorate. An international judge and a prominent lawmaker, El-Mahdi, 77, is a member of the advisory committee of the Cairo Regional Centre for International Commercial Arbitration (CRCICA) and the National Human Rights Council. Graduating with a degree in law in 1956, El-Mahdi started out as an associate in the technical office of president Gamal Abdel-Nasser, and later became an advisor to the justice and finance ministers. Over his extensive career, El-Mahdi has assumed several leading judicial posts. From October 2000 to September 2001, he chaired the Egyptian State Council and the High Administrative Court. From 1994 to 1997, he served as a constitutional advisor to the Kuwaiti emir. He was the only Egyptian judge to serve on the International Criminal Tribunal for the former Yugoslavia, the body tasked with prosecuting crimes committed during the country's wars. In 2007, El-Mahdi was selected by United Nations Secretary General Ban Ki-moon to be member of the tribunal trying suspects in the 2005 assassination of Lebanese prime minister Rafiq Hariri. He served on a fact-finding committee tasked with investigating violations committed during the January 2011 uprising. He also heads a national committee tasked with retrieving Egyptian funds from overseas. The post of minister of transitional justice and national reconciliation was created in 2013. The 68-year-old served as tourism minister from February 2011 until August 2012 under Essam Sharaf. He is currently secretary-general of the National Salvation Front, the main opposition bloc under Morsi’s regime. Abdel-Nour claims to have refused a ministerial position under Mohamed Morsi. As secretary-general of the Wafd Party, he was the first minister from an opposition party to hold a cabinet post for 30 years. He is also the founder of the Egyptian Finance Company and was a member of the National Council for Human Rights. He is a director of the Egyptian Federation of Industries and the Egyptian Competition Authority. Arab is a history professor at Al-Azhar University. He was head of the Egyptian National Library and Archives from 2006 until May 2012. He was first appointed Minister of Culture in May 2012, succeeding Shaker Abdel-Hamid. Arab resigned from the post in June to be allowed to win a state prize for social sciences worth LE200,000, which sparked controversy at the time. Arab was reinstated in Hisham Qandil’s cabinet in June 2012. Arab resigned again in January 2013 in protest at brutal treatment of anti-government protesters by police. However, he returned to his position shortly afterwards at the request of Qandil. He was replaced by controversial figure Alaa Abdel-Aziz in the cabinet reshuffle of May 2013, who faced weeks of protests from members of the arts community after his sackings of high profile culture ministry figures. El-Arabi served as planning minister from August 2012 until May 2013 under prime minister Hisham Qandil. He was replaced by Muslim Brotherhood figure Amr Darrag. An economist by training, El-Arabi received his doctorate from Kansas State University in the United States. For the majority of his career, he worked at the country's National Planning Institute. From 2006 until the end of 2011 he headed the technical advisory office of former planning minister Fayza Abul-Naga. After a brief interlude, during which he worked at the Arab Planning Institute in Kuwait, El-Arabi was called back to head the ministry. He was a key part of the Egyptian team negotiating with the International Monetary Fund over a $4.8 billion loan. Fahmy was dean of the School of Global Affairs and Public Policy at the American University in Cairo, and was Egypt's ambassador to the US from 1999 to 2008. Previously, he was the country's ambassador to Japan from 1997 to 1999. He also served as political advisor to the foreign minister from 1992 to 1997. The career diplomat has worked extensively on issues of Middle East peace and regional disarmament. Fahmy was born in New York in 1951. He has a bachelor's degree in physics and mathematics and a master's in management, both from the American University in Cairo. Sharaf El-Din was appointed by El-Beblawi and is the first woman to hold the post of minister of information. The information ministry has long been criticised for its control over the media, and since the January 2011 revolution many have called for it to be abolished. Sharaf El-Din is a significant figure in the state-run Egyptian Radio and Television Union. She previously served as the first undersecretary of the information ministry, heading the satellite channels division. She has also hosted several television shows including 'Sual' (Question) on a state channel and 'Ahl El-Raey' (People of Opinion) on the privately-owned Dream channel. Sharaf El-Din was also a member of the policies committee and the women's committee of Hosni Mubarak's now-dissolved National Democratic Party. Laila Iskandar is an Egyptian social entrepreneur who has worked on environmental projects that have received international recognition. She has worked extensively with garbage collectors in Cairo, particularly the community in Moqattam, winning the Goldman Environmental Prize in 1994 for her work. She also set up a recycling project in Sinai working with the local community. Iskandar was chairperson of CID Consulting (Community and International Development Group) that works with garbage collectors in Cairo on environmental initiatives such as recycling. CID Consulting received the award for Social Entrepreneur of the Year from the Schwab Foudnation at the World Economic Forum in 2006. Iskandar received the award from then-prime minister Ahmed Nazif in Sharm El-Sheikh where the forum was held. During her ministerial post, she stood against cement plants seeking to obtain cabinet approval to render coal an alternative source of fuel due to shortages in traditional fuels such as natural gas. The issue remains unresolved. Iskandar studied economics and political science at Cairo University. She then went on to gain a master's in teaching and a doctorate in education at UC Berkeley, California and Columbia University, New York respectively. Ismail is chairman of the state-owned Ganoub El-Wadi Petroleum Holding Company which manages exploration and production concessions, establishes joint ventures with private companies and constructs oil infrastructure. Gomaa is dean of the Faculty of Islamic Studies at Al-Azhar University, and a member Al-Azhar’s senior clerical institute. He was born in 1939 in Qalioubiya governorate. He earned his degree in Arabic in 1965 and later completed a master's degree and a doctorate. Gomaa worked at several newspapers as an Arabic proofreader and has been a member of the Journalists Syndicate since 1972. He is also the author of several books on religion. Abul-Nasr was formerly head of the ministry’s technical education sector. He was a faculty member at Cairo University’s mechanical engineering department. Abdel-Muttalib has been the chairman of the National Water Resource Centre since 2012. He has over 25 years of experience in the field of water resources management. He holds a doctorate from Colorado State University and is a member of the World Water Council. Abdel-Aziz was the head of the Shooting Club, a private sports club in Giza, and then became chairman of the National Council of Youth. He is a member of the Egypt Party, founded and led by moderate Islamic preacher Amr Khaled. Abdel-Aziz was director of the 2006 African Cup of Nations, which Egypt hosted and won. Othman is the former deputy head of the Court of Cassation. Younis is a major general in the army and chairman of the Arab Organisation for Industrialisation (AOI), a military-owned company considered one of the largest industrial organisations in Egypt. The AOI supreme committee is headed by the country's president and includes several other cabinet ministers. El-Adawi served as an assistant to two former ministers of health, Ashraf Hatem and Amr Helmy. He is also vice president of Banha University with responsibility for graduate studies and research, and head of the Egyptian Society of Orthopaedics. Madbouli is an architect and urban designer who was director of the UN's HABITAT Regional Office for Arab States. He holds a PhD in urban planning from Cairo University and a postgraduate diploma in urban management from the Institute for Housing and Urban Development Studies in Rotterdam. He served as chairman of the Gerenal Organisation of Physical Planning for almost four years. Madbouli is succeeding new prime minister Ibrahim Mehleb. El-Degwi was dean of Cairo University's Engineering Faculty from August 2008 until July 2012. He was appointed to the prestigious position in 2008 as there were no elections for the role at that time, but following the 2011 revolution, the dean position was put up for election and El-Degwy won. He was the head of the committee of elections for the president of Cairo University in 2013 and was appointed in late September 2013 as the aide to Cairo University's president, Gaber Nassar. He received his Bachelor of Science in Civil Engineering from Cairo University in 1975, and received both his masters (1981) and PhD (1987) degrees from the University of Calgary in Canada. He was nominated for the post of minister of housing in Kamal El-Ganzoury's cabinet which was formed after the ouster of Hosni Mubarak, but did not take up the post. El-Ashri headed the department of labour relations and collective bargaining at the ministry under Morsi and in El-Beblawi's cabinet. She has worked with most of the other cabinet ministers, and has played a major role in negotiations with striking workers. Hanafi is chair of the Internal Trade Development Authority (ITDA), a governmental body belonging to the ministry of supply. He was appointed chair of ITDA after a decision by outgoing Prime Minister Hazem El-Beblawi in late November 2013. He is also dean of the International Transport and Logistics faculty at the Arab Academy for Science, Technology, and Maritime Transport. Shaker is chairman of Shaker Group, a consultancy and engineering firm that specialises in electricity projects. His firm is currently designing and constructing the power generation plant of the Cairo Metro's third phase. It has also built major transmission lines and power generation plants across Egypt and other countries. Demian was first deputy finance minister for seven months from October 2012 to April 2013, when he resigned for apparent unease over the rising influence of Muslim Brotherhood affiliated economists, according to sources from the finance ministry. Before this post, he was deputy minister for five years. Demian has been a key Egyptian negotiator with the International Monetary Fund (IMF). In 2008, he was appointed as the Chairman of Deputies for the IMF's International Monetary and Financial Committee (IMFC). He was the IMFC's deputy at a G20 summit and chaired the IMFC communiqué drafting sessions. He was close to Youssef Boutros Ghali, a powerful finance minister from the Hosni Mubarak era who fled the country in February 2011. Demian attended Columbia University in New York, where he received a master's degree in international affairs and economic policy management. Wali is the secretary-general of the Social Fund for Development (SFD), a government entity that provides startup companies with financial help and other services. Her past experience includes a stint at the United Nations Development Program (UNDP) where she worked towards poverty reduction and job creation. She has previously called on the Egyptian government to encourage entrepreneur innovation and development in the microfinance sector. Waly was also a board member of the Consumer Protection Agency, the first government body for consumer protection, which was created in 2006. She studied at Colorado State University in the USA, earning a bachelor's in arts and humanities in 1987 and a master's in 1990. Kamal was appointed as the chairman of the national aviation company EgyptAir in August 2013. That same year he was also chosen as a representative for Arab airlines in the International Aviation Union. Kamal's career in the aviation industry has seen him involved with cooperation projects for fuel and equipment purchase as well as a plan to exchange used parts to cut costs on Arab airlines.